Malcolm tells us which files to backup and how often. Learn to use tar and the friendly taper archival tools. 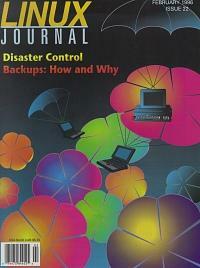 Prep yourself and your system for tape drive backups. A discussion of the use of e-mail filters on UNIX computers that use Sendmail-like systems. Karel Kubat explores XForms, a graphical user interface toolkit for X.